This article is about the Type. For the Alignment, see Water (Alignment). For the character, see Aqua (character). 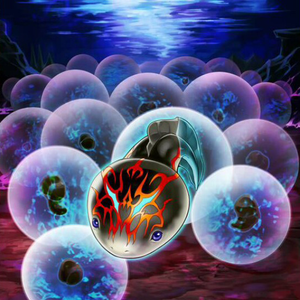 Artwork of "Underworld Egg Clutch"
Aqua (水（みず） Mizu "Water") are a Type of monsters usually represented by beings that have power over water or ice, such as "Mobius the Frost Monarch". They may also represent aquatic or amphibious creatures that do not fall under the category of Fish or Sea Serpent, like sea-borne mammals and amphibians. In the same respect, most Aqua-Type monsters are WATER monsters, though Aqua-Type monsters for almost every other Attribute do exist. Aqua-Type effects are varied, but many of the best focus on hand control. The "Aquaactress", "Frog" and "Graydle" archetypes fall into this Type. The majority of members in the "Gishki" and "Penguin" archetypes also fall into this Type. 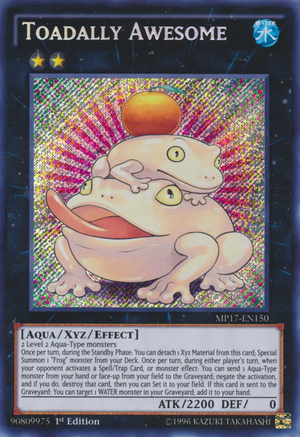 The Trap Cards in the "Paleozoic" archetype can also all treat themselves as Aqua-Type monsters. Other notable Aqua-Type monsters include: "Snowman Eater", "Cold Enchanter","Mobius the Frost Monarch", "Tribe-Infecting Virus", "Penguin Soldier", "Abyss Soldier", "Mermail Abyssgaios", "Gameciel, the Sea Turtle Kaiju", "Number 101: Silent Honor ARK", "Number C101: Silent Honor DARK" and "Toadally Awesome". The monsters that belong to this Type also gain a boost from "Umi", "Power of Kaishin" and "Wetlands". This page was last edited on 26 October 2018, at 18:40.